Summary: This article will show you 2 ways to delete iPhone contacts: one is the common way to remove contacts from iPhone Contacts app directly, and another is an advanced way to permanently delete contacts from iPhone via a 3rd-party iPhone Contacts Eraser. 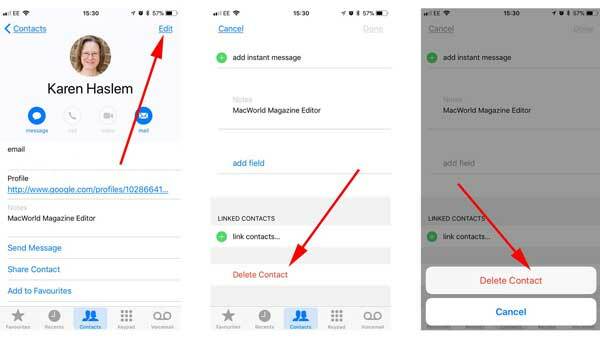 Want to delete contacts from iPhone? This seems an easy task. There are multiple ways available for you to delete all contacts from iPhone and you can choose whichever way you want according to the purpose you want to achieve. And the most common and direct way to delete contacts from an iPhone may be simply tapping the "Delete" button (see Part 1). It seems that you have successfully deleted your contacts from the iPhone. However, believe it or not, these deleted contacts can still be recovered by other people who use special data recovery software. The storing principle of iPhone is that once you delete files from iPhone, they are just marked as deleted and become invisible. They are still here and can be recovered back as long as they haven't been overwritten by new data. If you want to delete contacts in your iPhone forever, you need to draw support from third-party software. When you need to delete iPhone contacts, the first way comes into your mind should be deleting contacts from Contacts app. It is easy to complete the task and it is suitable for some iPhone users who only wants to hide contacts from iPhone Contacts app. Here, please allow me to remind you again that this simple "Delete Contact" option won't protect your contacts from being recovered by a third-party recovery tool. 5. Tap "Delete Contact" option again on the pop-up box to confirm it. 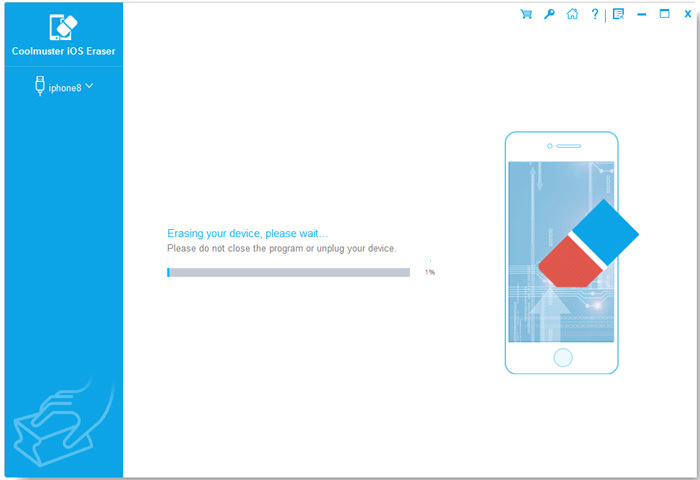 How to Remove Duplicate Contacts from Android Phone? As I mentioned above, the only way delete contacts permanently from iPhone is depending on a professional data erasing application. 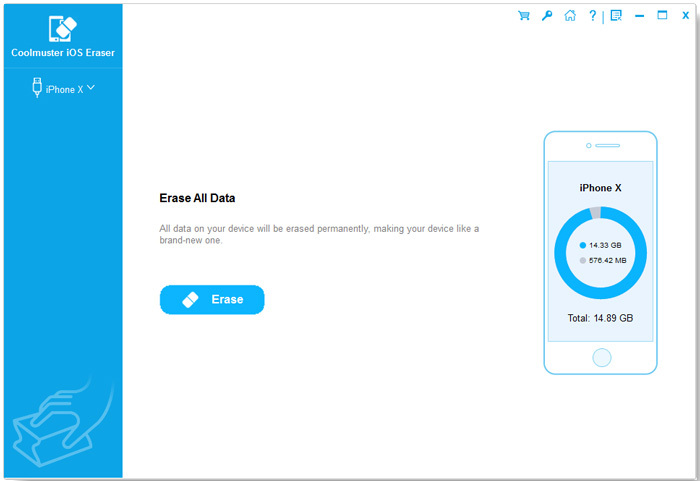 To save your time to look for a suitable tool by trial and error, you can try my recommendation: iPhone Data Eraser - Coolmuster iOS Eraser, which is fully capable of performing a quicker and easier contact erasing process on all iPhone models at once. It not only delete data from iPhone without recoverable, but also rewrite with random data in order to cover the erasing track. In addition to contacts, text messages, call history, notes, photos, Safari history, Safari caches and more can be deleted by this tool. And it is compatible with almost all iOS devices, including iPhone Xs Max/Xs/XR/X/8 Plus/8/7 Plus/7/6s Plus/6s/6 Plus/6/5S/5/SE, iPad Pro, the new iPad, iPad Air, iPad 2/1, iPad mini, iPad with Retina display, iPod touch/Shuffle/Nano/Classic and etc. Below is the tutorial showing you how to wipe contacts from iPhone by using iPhone Contacts Eraser. The Windows and Mac version are both available, so you should get the right version downloaded on your computer. 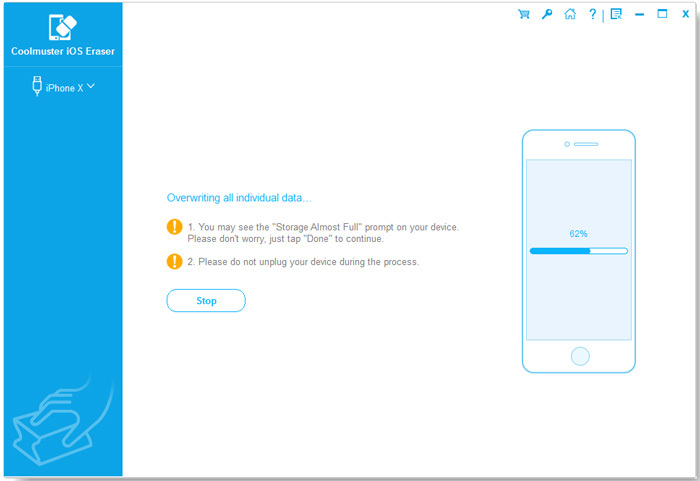 Tips: Please make sure to back up data on your iPhone before erasing, for the program will erase all data and settings from your iPhone without any chance to restore. Also, please install the latest iTunes on your computer for successful connection. Here, we will set Windows version as an example. Mac users can turn to the Mac version and refer to the same operations as below. Launch the contact erasing program on your computer after you download and install it. Then, you will see its clear and user-friendly interface showing like below picture. Connect your iPhone from which you want to delete contacts to your computer via the Apple provided USB cable and the connected iPhone will be detected by the program automatically. Tips: This will permanently erase contacts from your iPhone, please remember to back up contacts on your iPhone in case of unexpected data lost. Here are several data erasing mode provided by the program. 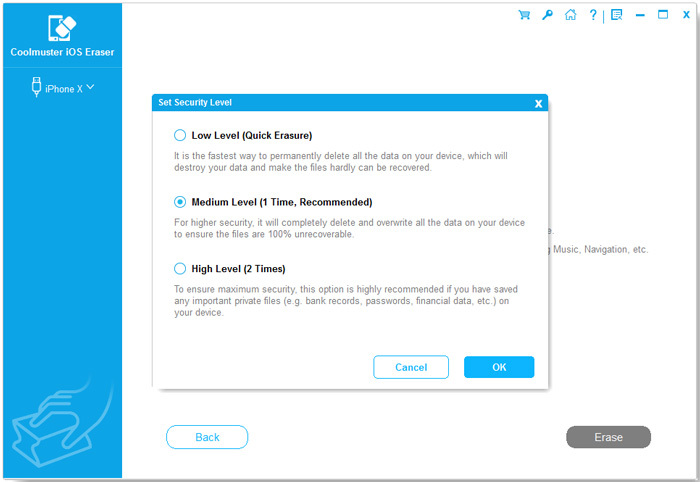 To delete your private data like contacts, please choose "Low Level", "Medium Level" or "High Level" mode to move on. If you have chosen "Medium Level" or "High Level" mode, the program will continue to overwrite your iPhone data. Please wait for a while. Done! Congratulations that you have already deleted all contacts from your iPhone. No any data recovery tool can recover them from your iPhone. Sounds amazing? Just try it out by yourself now! If you have any questions about deleting contacts from iPhone, please feel free to ask by leaving comments below. We will try our best to resolve your problem. How to Delete Contacts, Reminders, Calendars from iCloud? How to Easily Manage Contacts on iCloud?